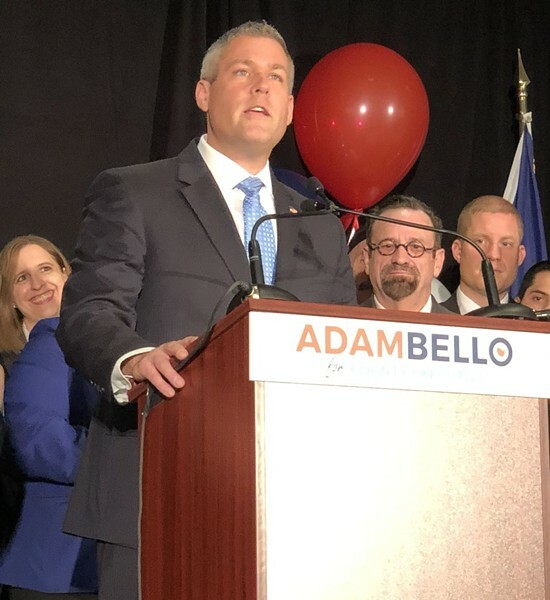 Democrat Adam Bello announced Saturday morning that he's running for county executive. But his candidacy was hardly a secret by that point: some city and suburban Democratic Committees had already designated him as their exec candidate. It’s been rumored for months that Democrats were interested in fielding Bello, the current County Clerk and former Irondequoit Supervisor, to challenge Republican incumbent Cheryl Dinolfo this fall. Democrat Adam Bello has announced that he's running for Monroe County executive. During his speech at the Workers United Hall on East Avenue, Bello criticized the current administration on several points, including the argument that they are somewhat hamstrung by state mandates. “Blaming other people for all of our problems, blaming Albany, blaming Washington instead of looking at how county government can do a better job inspire people, get people the resources it needs to invest right here, I think we’ve been failing and not doing that,” Bello said. The issue over taxes has been one brought up by both political parties in recent years. Republicans have touted the tax rate reduction that was part of the 2019 county budget, but Democrats have noted that the overall property tax levy has been going up. Democrats have also argued that Dinolfo was able to reduce the tax rate in her budget proposal because several municipalities have recently reassessed property values, driving the countywide tax base up. Jeremy Moule contributed to this article.